Award-winning actor Gary Sinise shares his remarkable journey and his quest to give back to America’s men and women in uniform. A self-described screwup in high school, Sinise found direction and purpose through acting, founding the celebrated Steppenwolf Theatre Company and going on to act in movies like Forrest Gump and Apollo 13. But Sinise eventually discovered another calling through his faith as an advocate for America’s military and first responders. 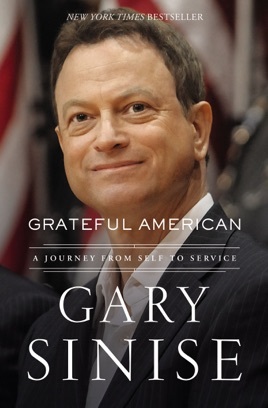 Sinise’s strong, straightforward style reveals his deep-seated values and self-deprecating humor, making Grateful American both entertaining and inspiring. The book reminds us how much of a difference one person can make. I just finished reading this book and I thoroughly enjoyed it! Gary Sinise is an actor that I have always enjoyed watching on tv and in movies plus I have always admired his work with the military. As a former military wife this hits close to home. I enjoyed reading about all the things that he does with his foundation! Pick this book up for a interesting, patriotic read.